Sylvie, of Langueux, France, is a product and interior designer with a passion for collecting vintage French decor items. She sells her finds in French Melody, an intriguing Etsy shop, but also enjoys creating new things with paper... this greeting card for instance, Faux Taxidermy. The deer arrive as diagrams which the recipient simply cuts out, folds, and affixes to the card blank... it becomes a quirky trophy to frame and hang. Clever! That's pretty funny... definitely caught my attention. I think my favorite part is the paper antlers. Cleverly crafted; each seems to have an expression of its own. So adorable! they look so peaceful. quirky, clever and absolutely adorable. I love them. She's good, she managed to do something nice and original with a horrible subject...! Well done. 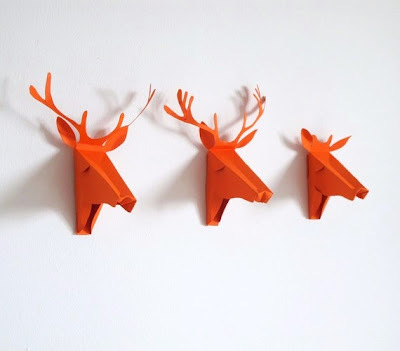 love the faux deer, how cute!